Gooner14's (Flickr user name) Double Cross DC, the first Double Cross DC build that actually has disc brakes that we've seen posted to anywhere. Thanks Gooner! Check out our Flickr pages for other builds. We will be posting Thayne's (our purchasing guy) custom painted rusty brown DCDC soon. Matt at Bicycle Time's (Dirt Rag's urban spin-off) just picked up a 60cm DCDC for his personal commuter. Keep up to date on his build on his blog. Hopefully we'll see a review in the summer or fall. The B-Side cross country frame has arrived, so if you want one, ask your bike shop or distributor to order. Less than 100 produced in this first run. The B-Side frame features a pure cross country geometry. You can only run disc brakes on it, but you can set it up single speed or geared. There is plenty of tire clearance for the 2.3" Pacenti Neo Motos, the fattest 650b tires currently made. 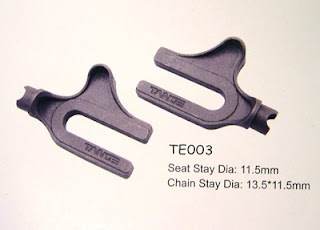 To increase standover clearance, the seat tubes run extra short, so a long seatpost is recommended. A suspension-corrected rigid fork is available. 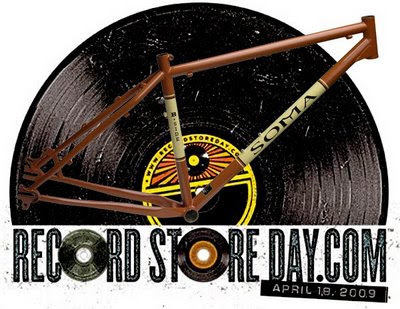 Though this totally unrelated to our frame or Soma, I thought it be cool to plug "Record Store Day" which is celebrated on April 18 this year. The original idea for Record Store Day was conceived as a celebration of the unique culture surrounding over 700 independently owned record stores in the USA, and hundreds of similar stores internationally. The Bay Area's own Amoeba Music and Rasputin Music are having special guests and give-aways. Go to the site to see how participating indie record stores in you neck of the woods are celebrating. Vinyl and steel -- both rule. Soma recently arrived in New Zealand through our cool new distributor there, Wide Open. 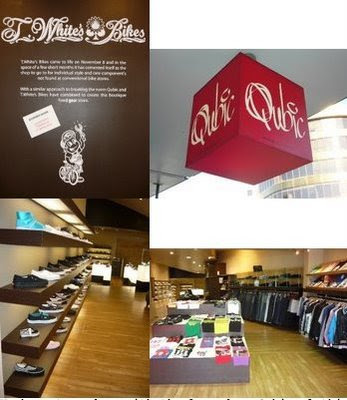 For those untravelled and can only equate NZ with the Lord of the Rings movies, let us show you the spankin' new T. Whites/Qubic boutique store. This is not "Little Bike Shop in the Shire". "We have teamed up with the legendary Qubic clothing boutique to create a store inside a store in the heart of New Market. Located in central New Market Qubic has the most dialed clothing and shoe selection in Auckland offering all the hard to find top shelf clothing you could ever wish for. Thursday The 9th is the official release date and its going to be a great combination between Qubic and T.Whites bikes in conjunction with All Track. 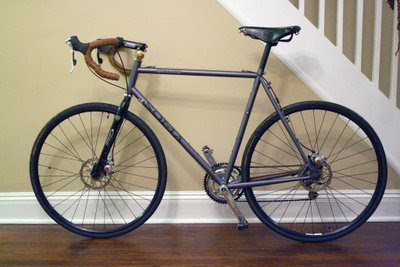 In 2010 the Soma Rush track frame will be upgraded with nicer Tange track dropouts and have fully removable decals. Our graphic vision from the beginning was to go with extremely subtle decals, because we had heard many people didn’t want to be “rolling billboards”, but even with our low key graphics, we’d get requests for decals the owner can peel off. So in 2007, we released frames with removable downtube and top tube decals (with just the headtube and seat tube logos being permanent). The immediate response was positive. But after a few months, we’d started getting e-mails again requesting us to make ALL the decals removable. At Soma, we always welcome customer input. But we were kind of torn with losing every speck of recognition on our most popular frame. It’s a pride thing. we knew they were right. 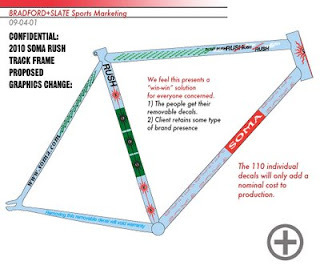 Here is the unofficial reveal of the new graphics scheme for the 2010 Soma Rush. Each Rush frame will have 110 individual, removable, vinyl decals on the frame. (We calculate we can fit 130 on the 59 and 61cm). The kids can peel stickers to their hearts’ content. The marketing company estimates, “21% of the decals will NOT be thrown in the garbage, but actually end up stuck to a lamp post, mailbox or sideview mirror. That should help generate the critical guerilla marketing you’ve been lacking.” Freakin' genius. Expect the new frames to drop in October.